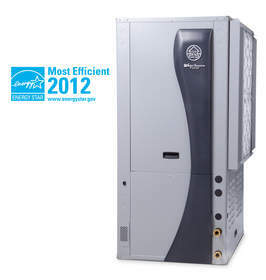 FORT WAYNE, IN--(Marketwire - Oct 25, 2012) - WaterFurnace International, Inc., the leading manufacturer of geothermal and water source heat pumps, announces that its 7 Series variable capacity unit has achieved the ENERGY STAR® Most Efficient 2012 designation. The 7 Series joins the WaterFurnace 5 Series, Synergy3D® Series and Envision Series, all of which achieved the honor earlier in 2012. In its second year, the ENERGY STAR Most Efficient designation identifies and elevates the most efficient products among various ENERGY STAR categories. To qualify, products must demonstrate efficiency performance that is truly exceptional, inspirational or leading edge -- consistent with the interests of environmentally motivated consumers and early adopters. "We're particularly proud that our flagship 7 Series, the first variable capacity geothermal unit available to homeowners, was recognized with the Most Efficient designation," said Tim Litton, director of marketing at WaterFurnace. "We believe that receiving this honor for yet another product reflects that the WaterFurnace brand represents best-in-class innovation and energy efficiency." The 7 Series 700A11, released earlier this year, represents breakthroughs in energy efficiency, communication technologies and comfort. It is the first variable capacity geothermal unit available for homeowners, and its 41 energy efficiency ratio (EER) and 5.3 coefficient of performance (COP) ratings are more than twice that of traditional air conditioners or heat pumps and 33 percent greater than current geothermal units. The 7 Series also utilizes Aurora, WaterFurnace's next-generation of logic boards, to continuously monitor and optimize operation. Aurora provides a platform of two-way communication between components, robust troubleshooting capabilities and advanced communication protocols. This includes integration with IntelliZone2, the only zoning package capable of controlling a variable capacity compressor, and with Symphony Home Energy Management, which provides device control and detailed real-time energy monitoring from any Internet-enabled device. To earn the 2012 Most Efficient designation, a manufacturer must be an ENERGY STAR partner in good standing and have their product's performance certified with an Environmental Protection Agency-recognized certification body. The program continues ENERGY STAR's work to provide consumers with the best efficiency information so they can make investments that will lower their energy bills and environmental impact. Consumers will be able to identify Most Efficient products on the ENERGY STAR website and in stores by looking for the Most Efficient designation. To learn more about 7 Series and other WaterFurnace products, visit the WaterFurnace website at www.waterfurnace.com. About this company WaterFurnace International, Inc.